I think its true when its said that you teach what you most want to learn. I had an inspiration last night – to awaken your intuition, dear reader as well as mine, with a simple exercise to do right now. My last post was about developing ones intuition and I suggested an exercise, but I realize how easy it is to put something off till tomorrow and not ever get round to doing it. What I would like you to do, is bring up Notepad on one side of your screen and have the picture of the Queen of Cups on the other side of your screen. Breathe deeply as you look at the picture and note down any impressions that come to you. Let the impressions flow, don’t edit them. 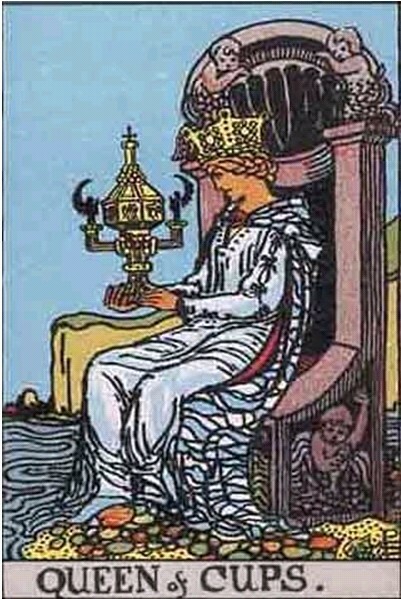 You may hear some words, see things move in the picture, have a feeling about the card or ideas may come to you. Whatever way your intuition speaks to you is the right way for you. Do that right now. Then leave me a comment to let me know how you got on. I think you will find this to be a very interesting and enlightening exercise and it will only take a few moments of your time. I’m going to do this too, I will leave my impressions on a separate page. Click here to subscribe to the bi-monthly Intuition Development Newsletter ‘INTUITIVE’.